First, I must thank Wai Fon for pimping me! She spoke of my Spidey senses. I’ll relate the same story. 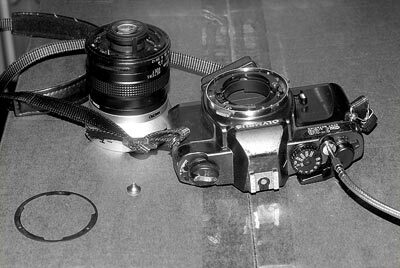 I was shooting a starry sky with my Olympus OM-2000 and Vivitar 24mm F2.0 and a second-hand shutter release cable. The button on the cable unscrewed itself and rolled outside my house gate! I wanted to get my house keys, but the camera and tripod got in the way. I collapsed the tripod slightly, and leaned it against the wall that separates me and my neighbor. I walked past it. Usually, in the world of Albert, many things can be precariously balanced and defy gravity. This night however, everything came crashing down. 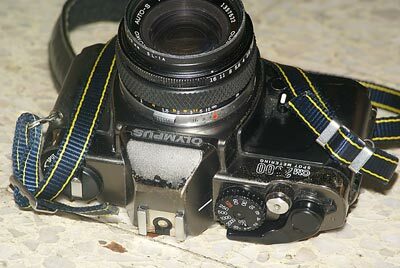 My OM-2000 took a nosedive! Usually, if I saw something fall, I’d be able to catch it. I have such Spidey sense. The impact was so powerful, the tripod head left a mark on my camera’s base! It also caused a crack near the film winder, and the film winder can pop off. Fortunately, there was no light leakage as the film transport area is sealed. 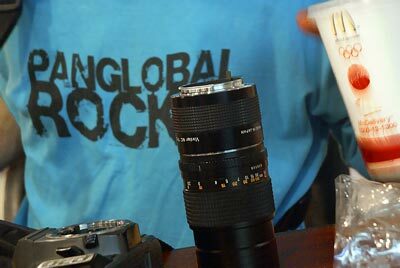 Fortunately, too, that it wasn’t my Sony A100 and any of my beloved Minolta lenses. However, it misaligned something in the Vivitar 24mm F2.0, causing it to be unable to focus to infinity, somewhat permanently macro; fortunately, it was the same lens I had opened many times before so I was somewhat familiar with it. It also would not stop down to F8 or darker. A major debilitation for a wide-angle lens whose primary objective could be landscapes. 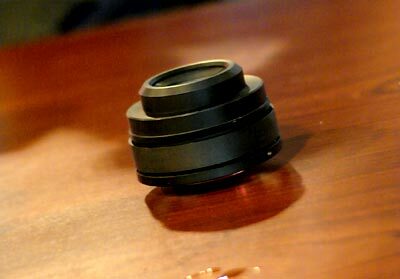 Aperture ring and ball-bearing used to give you that nice clicking feeling when you turn the aperture ring. 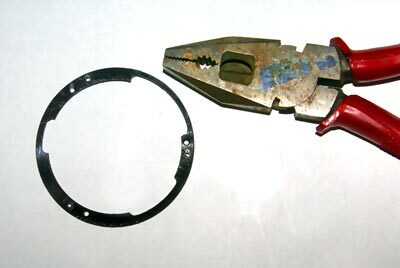 There was a disc that wasn’t flat; I used pliers to violently bang it to flatness. Alas, I had to open it a few times, each time getting closer to infinity. Finally, I opened an area I had not opened before! 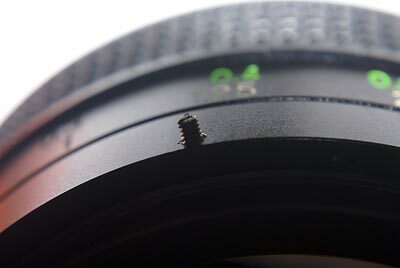 Hidden screws on the focusing ring, painted over in black. Of course, once reassembled, the lens wouldn’t let me go that far beyond infinity. Just a little bit. But still enough to optically get beyond infinity! Another side effect I recently discovered? Mirror Lock Up! When there was no lens, I could shoot, and the mirror would stay up. It was held up by the aperture lever (near the red dot). Moving the aperture lever clockwise tells the camera that the lens has a brighter aperture, so it can adjust the meter accordingly. To return the mirror, I just needed to move the aperture lever a tiny bit. 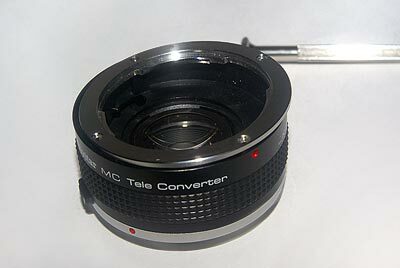 The aperture lever only ever holds the mirror up when it’s all the way down, so if a lens is mounted at even F22 it would not cause mirror lock up. 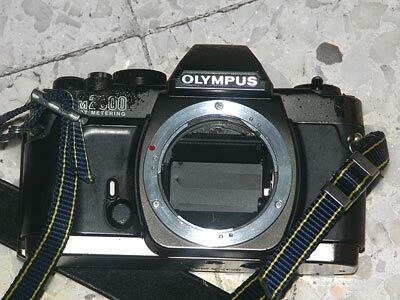 I could, however, exploit this; the Olympus Zuiko 50mm F1.8 here is mounted but not yet clicked into place. (Note the red dot should be upwards.) 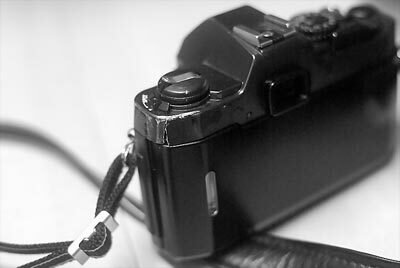 Fully stopped down at F16 it will not nudge the aperture lever and thus release the mirror. Because the lens wasn’t correctly mounted, I’d have to stop down while shooting by pressing on the DOF preview button on the lens. A major benefit of mirror lock up is that you wouldn’t have mirror slap, and in theory could shoot at slower shutter speeds without handshake. You won’t hear the mirror slap either. I have not tested this with a roll of film. 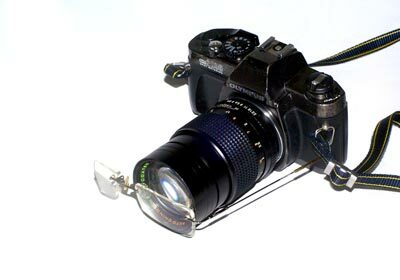 The downside is that with the mirror locked up, you would not be able to see anything through the viewfinder, so it would be wise to focus beforehand and use your other eye to shoot. Or shoot like a rangefinder! It also does not meter because the mirror is up. So, the shot must be set up beforehand with lens on normally, before dismounting the lens and locking up the mirror. 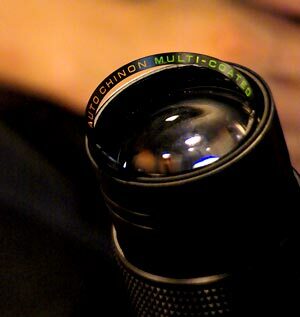 Auto Chinon 135mm F2.8 Pentax K-mount on Vivitar 2x teleconverter (OM-mount front, K-mount back) on Olympus OM-2000. Yes, I am promoting the interracial, intermountal marriage of different mounts. Of course, because the lens wasn’t aligned, it had a slight tilt/shift tilt effect, and it would not focus on infinity. Unless, of course, you get negative diopter lenses to restore infinity focus; thanks Shaz for your contribution to science! 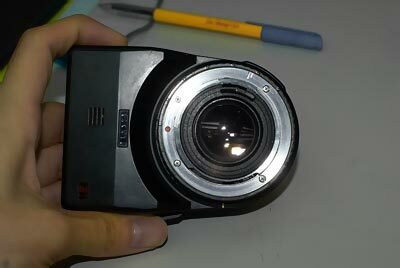 It’s a -200 power (or -20 lens) so that should give me plenty of space to muck around with making a proper adapter. 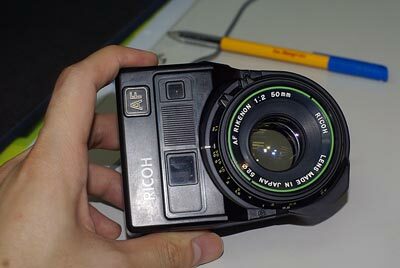 I found this in an old-timer camera shop on the ground floor of Ampang Park; a Ricoh AF 50mm F2.0 lens! 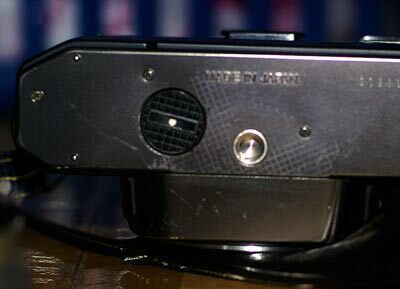 This was one of the first implementations of auto-focus; focus detection was done on the box stuck to it instead of the camera! It required batteries and looked uncool. I think you can figure out why it never caught on. 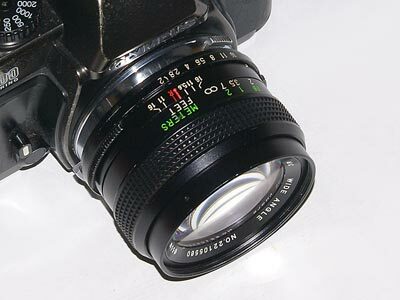 Ricoh lenses use the K-mount too. 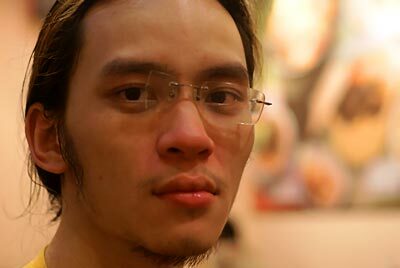 Speaking of which, I must plug Albert Cheah of Cheah Camera Repair, Mutiara Complex, Jalan Ipoh. He does excellent defungusing and lens fixing. I just wished his shop didn’t close before I could get there after working hours. Saturday afternoons, between 12-3pm are a safe time to visit; he has loads of rangefinders and other camera pr0n. 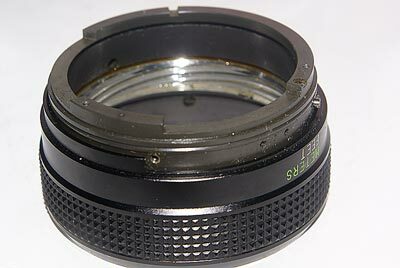 I sent my Vivitar 75-205mm F3.5-4.5 and matched 2x teleconverter for defungusing. Xian Jin (formerly known as The Pink Frog) helped me collect it. I was amazed how shiny and black it was! It was almost spotless minus one bit he couldn’t clean. 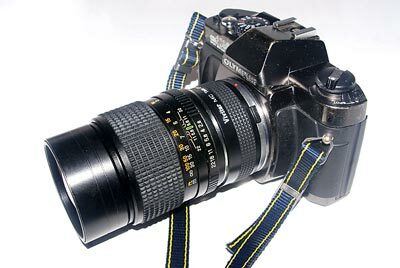 However, I’ve seen a Minolta 70-210mm F4 beercan that he cleaned, and it has better contrast than mine! 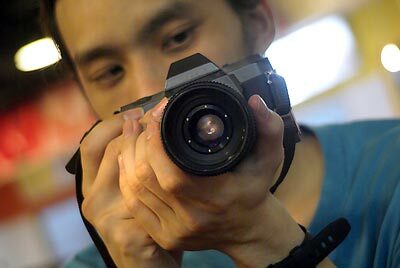 Another Minolta 50mm F1.7 he cleaned had higher contrast than my Minolta 50mm F1.4 even! I excitedly put my Auto Chinon 135mm F2.8 K-mount lens on the Vivitar K-mount matched 2x teleconverter meant for the 75-205mm F3.5-4.5… and it got stuck! I tried to open it there and then, at McDonalds. I got this far; removing the front element! 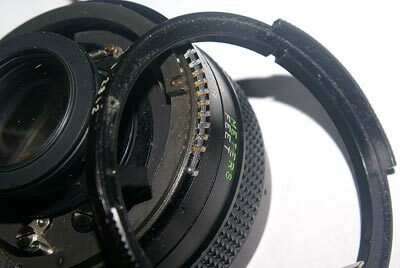 I got home, and jammed a key on the aperture lever of the teleconverter, while forcefully dislodging the lens. It worked at last! This entry was posted in Geek, Pictures on April 1, 2007 by 2konbla.